President Barack Obama has successfully transformed America's strategic dialogue with the world for the better in his first year, impressing Europe -- or at least eminently sensible Norway -- enough to win a Nobel Peace Prize. In relationship after relationship, America now finds itself talking about what really matters, which in most instances means prioritizing economics above terrorism (George W. Bush's one-note presidency) and climate change (Al Gore's shrill post-vice-presidency). Continue to read the week's New Rules column at WPR. 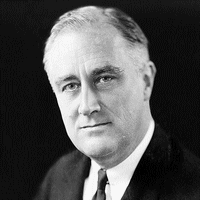 Photo: Franklin Delano Roosevelt, 1933 (Photo by Elias Goldensky). The problem for the President is that the US no longer controls proliferation of nuclear weapons or its own economy. Basically the last 6 Presidents have frittered away US power on largely meaningless activity for the long run. The 21st Century will be very tough and mostly one term Presidents until political party realignment is fully accomplished by the 2028 Presidential election. IMO of course.Someone needs to be telling the political leadership of both parties that they are only dreaming if they think they are in charge of and running the world. NOT TRUE! Tom, this article is one of your best strategic summarys & recommendations. +1 to what elmer said. Great article. It felt like a good one, and I said as much to Sean prior to sending off. I really wanted to write a column solely on human rights and DPRK/Iran, but the lead in kept stretching and stretching and I realized I had a lot to say before getting to that. Tom,Nothin but net from the three point line! The more I read your take on these things and listen to the hype in comparison the more I realize I need yoga. Maybe a good scotch too. Good to take a step back and THINK.